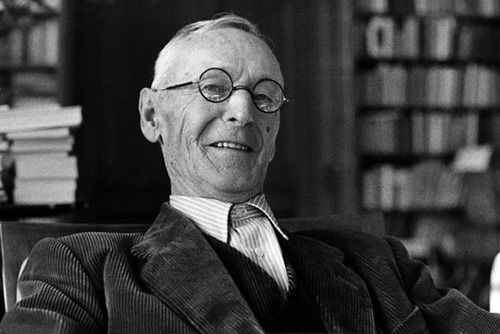 I’ve talked about my discovery and love of Hermann Hesse’s work before here, and I’d intended to re-read more of his books, but new ones have just got in the way. However, today is his birthday, which has reminded me again of his writings – so here are a few of his words which appeal to me. I hold still and listen a long time. Were like me, and were my brothers. And an animal, and a cloud bank. And asks me questions. What should I reply? The way that these were formatted on my phone made the quotes look like poetry. They read like poetry as well, but I guess it’s prose? The middle quote *is* poetry – and I don’t think I’ve ever read any of Hesse’s poems before, but now I want to! I read some Hesse years ago but have to admit I can’t remember anything about them. I *do* want to read more of the poetry, definitely! Not only a great writer, but also a very smart man and philosopher. The first excerpt is from a short essay called ‘Rainy Weather’. No need to say it’s awesome reading. I read Siddharta a long time ago …plus also something else, but I don’t remember any more what it was. Thanks for the post and Happy Birthday, Herman! “Awesome reading” is right – I need to go back to his work! 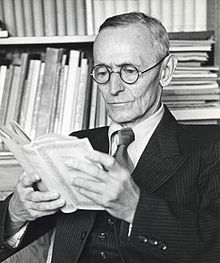 I’ve never read any Hesse. Do you think I’d like him, and what do you recommend I start with? I’m afraid not. As I said in another comment, it’s one I sourced online, where it floats about a lot but without attribution. Sorry!